The most important meal of the day is too often ignored, lost amidst the grooming and rushing, a mere afterthought to caffeine. It takes hungry, curious children to remind us to slow down (acorn pancakes!) or friends visiting from afar to convince us to unearth our skillets. 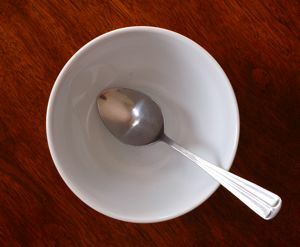 As someone who grew up slurping big bowls of soup before heading off to school, I still haven’t learned how to enjoy cold cereal or dry toast. Give me some leftover rice and a runny fried egg, though, and I’m ready for anything that Monday wants to throw at me. You’d think that in the Bay Area, we’d be able to find breakfasts from around the world more easily: a plate of Turkish cheese and olives with some sourdough bread, spoonfuls of soft pongal or tender idli, even a bowl of pho or mohinga before 11 am. I imagine, though, that in the quiet of our kitchens, on all sides of the Bay, folks are preparing breakfast far outside the confines of frosted flakes. It’s our most private meal, the one most dependent on comfort, habit and home. The Irish and Filipinos, hearty eaters, have no problems sharing their breakfasts with a paying public. Nor do the Chinese, whether you’re in the mood for a soothing bowl of jook or a parade of dim sum. To get you thinking about morning meals…. Jon Huck’s photographic study of breakfast is elegant and inspirational (via Mister Starfish). Not for the faint of heart, a traditional Irish breakfast covers all the important categories of meat: sausage, bacon and egg. Don’t forget the Batchelors beans, a tomato, and both black and white pudding. Brew lots of strong Irish tea to wash it all down. Although the range of Pinoy breakfast is impressive, the default in Daly City has long been a mound of fried garlic-flecked rice served alongside Spanish-style longaniza sausage and a generous pile of sweet tocino, Southeast Asia’s answer to bacon. Like the Irish, Filipinos like to round out their meal with a fried egg and a bright spot of tomato. Hot and filling, easy to make and even easier to eat, this soup appears in pretty much every Asian country. Even its translation has nuances of flavor: congee, cream of rice soup, rice porridge, rice gruel. It’s an innocent base upon which anything can be built. My own favorites are thinly slices of fish and freshly shucked clams. My husband’s family serves it with pickles. My mom makes it with duck bones, while every year, during the last week of November, there’s a flood of turkey versions across the country. Fortunately, jook restaurants abound, and their menus are long. Be sure to order a plate of you tiao “fried ghosts” crullers on the side.